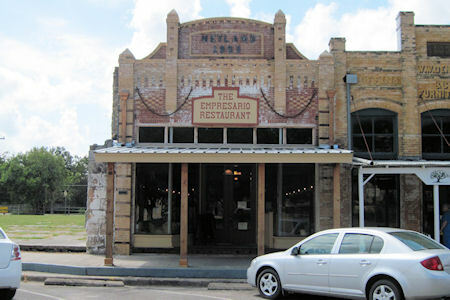 The Empresario Restaurant in Goliad is located on the courthouse square. I was staying at Goliad State Park and decide to take a turn around the square to see if there were any interesting places to eat. I spotted at least two, but I pick the Empresario. Why, because it had the most cars sitting in front of it. Not fool proof way to judge the quality of a restaurant but it is better than flipping a coin. 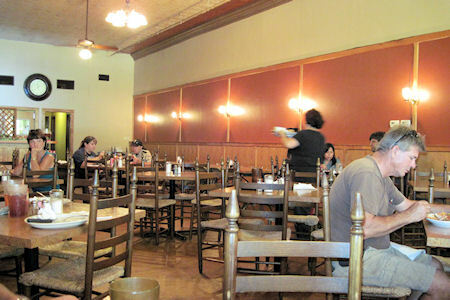 The dining room was open and uncluttered. There was fairly good crowd of dinners considering the time of day we were there. I ordered the hamburger steak and a diet coke, the special of the day was chicken enchiladas, but I think only beef belongs in enchiladas. I'll get back to the chicken enchiladas later. The wait time was reasonable, fast enough not to ever wonder where your food was, and slow enough to assure you that you were not in a fast food restaurant. The hamburger steak was good, served with green beans, fries, fresh roll and a simple dinner salad. The green beans had bacon in them just like grandma use to make. 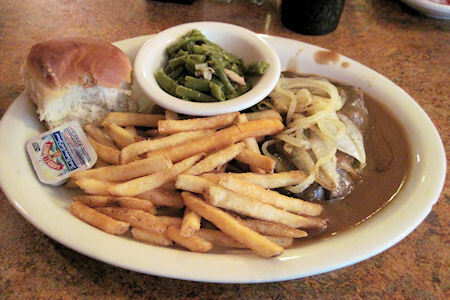 The hamburger steak smothered with brown gravy and grilled onions. It was cooked just right and tasted good. 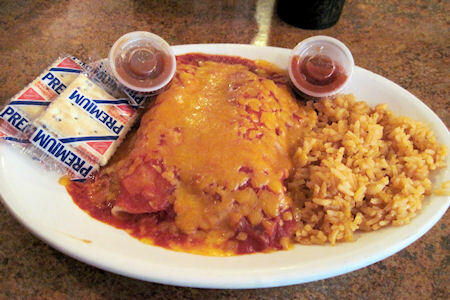 My wife ordered the special of the day, chicken enchiladas. The chicken enchiladas are served with Spanish rice and refried beans. (not pictured) The only surprise was I would have expected tortilla chips. But that was a nominal oversight compared to the high quality of the enchiladas. One of the reason I don't like chicken enchiladas is that normally the chicken you find in chicken enchiladas is not the best quality. I guess most places think all the cheese and sauce will make up the difference. The chicken enchiladas served at the Empresario Restaurant are of the highest quality. They were great. The hamburger steak was good, the chicken enchiladas were great but the best part of the Empresario Restaurant was the owner, or I assume he was the owner. I did not get his name but I wish I had. He greeted everyone that came in. He seemed to know everyone and gave about half the people a friendly hug. When I went to the cash register to pay out he chatted with us for awhile. He recognized that we were from out of town. He gave us several recommendations for places to go and things to do in Goliad. He was just a perfect host. Treating people like family goes a long way to making the good food that you serve taste like home cooking.